Last month, Manhattan Borough President and mayoral hopeful Scott Stringer revived hopes for what he called "the X line," also known as the Tribororx. This line was proposed in the Third Regional Plan in 1996. In 2007 Michael Frumin, now an MTA manager, worked with the Regional Plan Association to flesh out the idea. The proposal was to run rapid transit along existing rail rights-of-way from the Brooklyn Army Terminal in Bay Ridge to Yankee Stadium in the Bronx. There have been objections about using the right of way for rapid transit. The old New York Central Port Morris Branch in the Bronx is the only portion that is currently unused. The Hell Gate Bridge is used by freight and Amtrak trains. The rest of the way is occupied by the New York Connecting Railroad and the Bay Ridge Branch of the Long Island Railroad, freight railroads that see a significant amount of traffic. If the Cross-Harbor Freight Tunnel is ever built, it will connect to these lines. From the Brooklyn Army Terminal to New Utrecht Avenue the right-of-way is very wide, with plenty of room for two new subway tracks next to the existing tracks for the N train and the Bay Ridge freight line. The Hell Gate Bridge can fit all the Amtrak and freight traffic onto two tracks, and has a third track and room for a fourth. The crunch would be from New Utrecht Avenue in Brooklyn to 50th Street in Queens, where there is one track in use, but the right of way only has room for one more. In 2008 I found that the Draft Environmental Impact Statement forecast 24-64 trains per day using these lines, for an average of 1-3 trains per hour. If the line is restored to two-track service, that would allow plenty of time for commuter trains, or even more frequent service if the freight trains are only run late at night. Another option is to tunnel under the existing right-of-way in the two-track section and run freight trains underground and passenger trains on the upper level. This would be expensive, but not as expensive as building a new subway. I also suggested that it might be easier to extend existing subway lines along the right-of-way, thus providing a one-seat ride to neighborhoods closer in, than to run a single train the whole way. 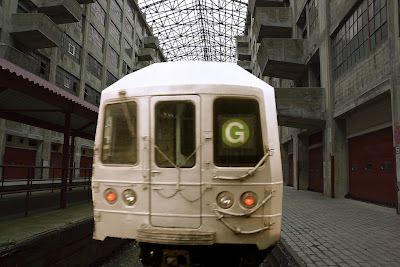 So for example, you could extend the B train across the Hell Gate Bridge to Woodside; extend the M train, either from Middle Village or from Jackson Heights, north to the Bronx or south to East New York; extend the L train west to Brooklyn College, or extend the G train south and west to the Brooklyn Army Terminal. I created this fantasy map showing the route that the G would take and some possible stations. I was inspired in part to write this because of the recent post on Scouting NY showing the inside of the Terminal itself. There are offices now where the warehouses used to be, but Building B still has the tracks in the middle, waiting for a G train to glide in. The G train arrives in the Brooklyn Army Terminal, with a little help from Pro-Zak and bitchcakesny. You could even use the skycrane to lift commuters up to their offices. Door-to-door service! That's the least important part of the TriboroRX route, serving areas that are already well-served by the subway. Your proposed G train would also be very circuitous. The first priority with the TriboroRX route should be extending/branching the L train along the cut to the Brighton Line. This would serve some of the Flatlands residents currently packing the B44 and B46, and connect southern and eastern Brooklyn. There is plenty of room along that segment. The second priority should be extending the M train from its Metropolitan Ave terminus along the NYCR and Hell Gate route to the Bronx. The NYCR is too narrow for this to co-exist with freight trains, but freight could instead run from Fresh Pond Junction along the Lower Montauk Branch to Sunnyside Yard and join the Hell Gate line there. Something like this. No tunnelling required. Once those are done we can consider whether a circuitous train to Brooklyn Army Terminal is worth the cost. The problem with the line as proposed, using the NY Conn RR & LIRR Bay Ridge ROWs, is that it just misses where the people - potential riders are as much of the line runs through industrial areas. In addition the problem of mixing rapid transit trains with mainline freight trains is being handled far too cavalierly. Clearances between passing trains, at platforms, signaling systems, the crash worthiness of NYC subway cars (the FRA would no doubt require some ridiculously heavy over built car), etc, etc all could present some really serious obstacles. Doing a Triboro subway the right way? Build a proper two track subway from Wash Hts/181 St, connect the dots of Fordham Plaza, West Farms, Pkchester, then under the river to LAG, Queens Center then up onto the defunct LIRR Rock line to JFK, with a branch swinging west and connecting to the tail tracks at Euclid Ave. The Fulton St branch could terminate in Court St station. Of course the museum would need to be relocated. Yeah it would cost billions so it's never going to happen. @capt subway: There are plenty of potential riders in Melrose, Astoria, Middle Village, East Flatbush and Flatlands, all residential areas. 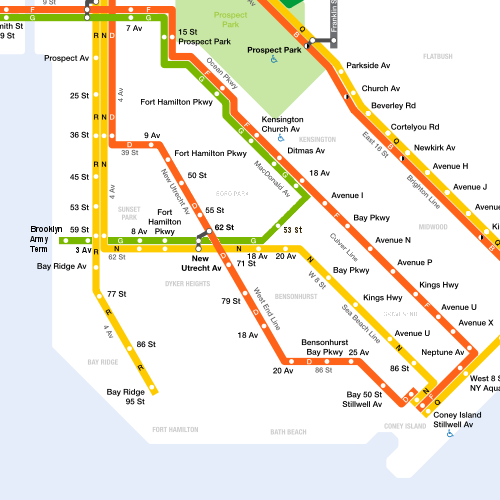 It's true that there are some other corridors where the potential demand for a transit line is even greater, but the Bay Ridge and NYCRR rights of way offer the best "bang for buck" of any route outside Manhattan. Nobody is proposing mixing freight and subway trains on the same tracks. Most of the right of way is wide enough for four or more tracks (two for subway and two for freight); Capn's original post and my proposal above offer ways of working around those segments that aren't wide enough. Freight trains running next to subway trains on separate tracks should NOT be a problem; this is already the situation on Hudson-Bergen Light Rail for example. Capt, where are the industrial areas around this section of the Bay Ridge Branch, other than right around the Navy Yard?